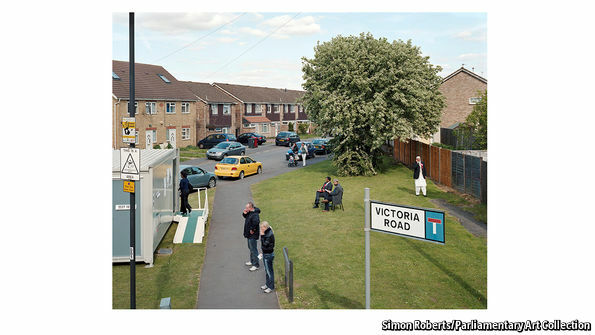 Simon Roberts was the “election artist” for the 2010 general election in the United Kingdom. He chose 24 images — one for each day of the campaign — to reflect the geographical breadth of the trail. Cornelia Parker is the election artist for 2017. Not long ago, my husband pointed out a story about official “election artists” in England. That was a new idea for me. An article in the Economist offers background. Parker is the first woman chosen since the post was established in 2001 and the first conceptual artist. “Ms Parker is using an Instagram account (@electionartist2017) to offer an eclectic commentary: so far she has posted pictures of road signs, homeless people and newspaper headlines. One image, captioned ‘The election contenders,’ shows a group of waving garden gnomes. I searched the web but couldn’t find Parker’s piece for the permanent collection. Maybe a reader will find it for me. It’s hard to envision what an artist known for “detonated sheds, cut-up shotguns and squashed instruments” would come up with, even if she is currently focused on instagram. The Economist story is here, the Guardian‘s here and the New Yorker‘s here. My husband loves learning about the origins of language. He recently sent me an article about English pies and pie-related expressions. Norman Miller at the BBC explained, “Every March, St Mary’s church in the Leicestershire town of Melton Mowbray becomes a cathedral of pies: it fills with tables bearing more than 800 pastries. “Even in their early days, pies served different purposes for the rich and poor: as show-off delicacies for the former and portable food for the latter. ‘Eating humble pie’, meanwhile, comes from medieval deer hunting, when meat from a successful hunt was shared out on the basis of social status. Be sure to read about some great English pastries here, especially the traditional pie with sardines gazing up from the crust that commemorates a 17th century fisherman who saved his village from starvation. As for squirrel pie, if Erik doesn’t find a way to keep a local squirrel from getting into the bird feeder, I fear that scalawag’s fate is sealed. Hungry, anyone? Famed physicist Stephen Hawking has ALS and has to talk using an electronic voice substitute. Recently, as part of a skit for the antipoverty charity Comic Relief’s Red Nose Day fundraiser, he pretended to audition a bunch of well-known actors to be his newest voice. Erin Jensen reports at USA Today, “A new, highly sought after role might not win actors any Oscars or BAFTAs, but that’s not stopping Hollywood’s elite from auditioning. “In the clip, Hawking, who has ALS and communicates with synthesized speech, reviewed tapes from the self-described ‘intelligent … kind of’ Anna Kendrick and Rebel Wilson, who got a hard no from the physicist. Hawking also wasn’t persuaded by The Theory of Everything stars Felicity Jones and Eddie Redmayne or the ‘soothing, calming voice’ of Gordon Ramsay. “Hawking wasn’t Taken with Liam Neeson’s voice either, despite the actor’s opinion that it possessed ‘a tinge of … physics.’ ” More. For the true story behind Hawking’s voice, read this Wired article. Joao Medeiros details the many iterations of the technology underlying Hawking’s ability to communicate, but he notes Hawking likes his original “voice” and has stuck with it. A while back, I wrote about Lata, which teaches older folks around the world to create street art with spray paint. I follow Lata on Instagram and can confirm that the results of senior graffiti are a hoot. Now Vicky Thornton writes at Arts Professional about starting a modern dance troupe for people over 60. There’s hope for us all. She writes, “DANCE SIX-0 started in response to a visit to the Elixir Festival at Sadler’s Wells that included a performance by the Company of Elders, a contemporary dance company for people aged over 60. Judith Bossano, Meg Edgar and Philippa Heseltine were inspired to establish a similar opportunity for contemporary dance in Salisbury and sought my advice and support. 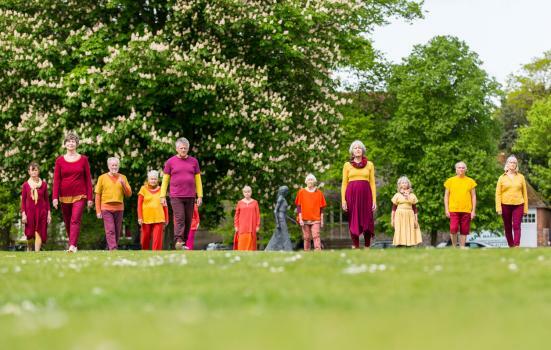 “Meg felt this was something needed in Salisbury, recognising that dance brings many physical, social and emotional benefits that are so important for overall wellbeing. She identified Salisbury Playhouse as an ideal venue, considering its location, facilities and audience base. I’m down with that. Read more at Arts Professional, here. DANCE SIX-0 is a contemporary dance company for the over 60s in Salisbury, UK.